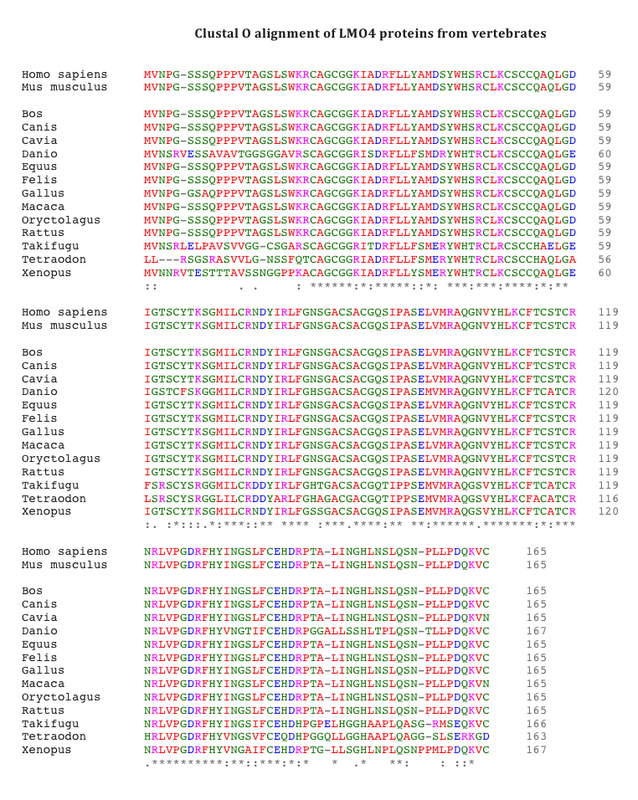 The first gene in the class, subsequently named the LIM Domain Only genes (LMO), was found as a transcribed region on human chromosome 11 band p15 near to a T cell acute leukaemia chromosomal translocation breakpoint  . 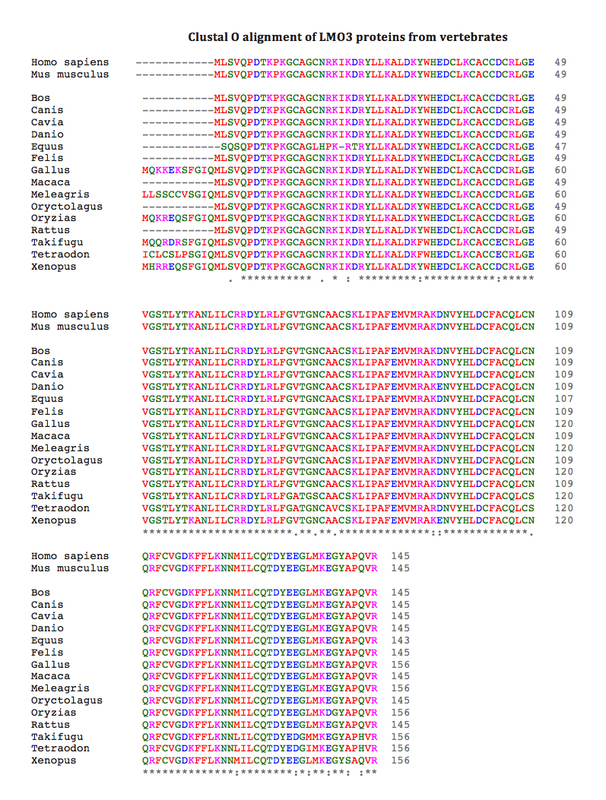 cDNA cloning showed a short coding region (initially designated RBTN1 or TTG1) that became known as LMO1. 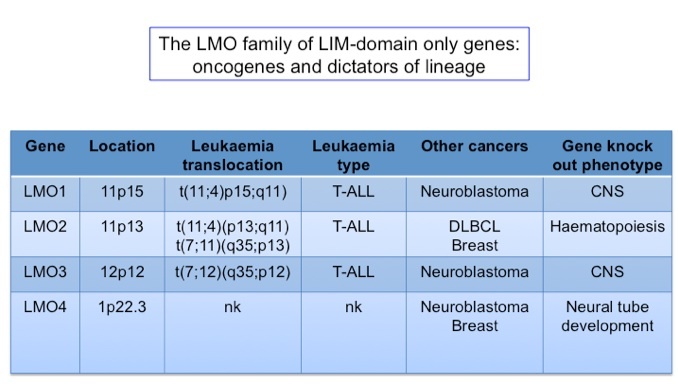 There are three other members of this family, two of which (LMO2 and LMO3)   are also adjacent to T cell acute leukaemia chromosomal translocation breakpoints. The fourth gene (LMO4) has no known association with translocations but has been implicated in breast cancer. Table 1 summarises the chromosomal locations and clinical associations of the LMO genes. The LMO protein are conserved in evolution and each has two LIM domains comprising two LIM fingers co-ordinated by zinc atoms. These are not typical zinc fingers but rather are involved in protein-protein interactions. The LMO2 protein complex is the most well studied following initial characterisation  and demonstration of the requirement for LMO2 in haematopoiesis . There is conservation of the orthologues and paralogues shown in the Tables below. 25 years ago, the LMO2 gene was discovered near areas of chromosome damage in human blood cells, leading to cancer. LMO2 has since become a paradigm of a cancer gene caused by chromosome damage. It was also found to cause cancer in gene therapy trials involving bone marrow transplantation. Normally, LMO2 is an essential protein that performs critical functions in the development of the blood cells and some aspects of blood vessel formation while it has also recently been used as part of a mixture of proteins to create artificial stem cells. LMO2 is both a key-player in stem cell medicine and also a target for anti-cancer therapies. There is potential for therapeutic targeting in diseases where angiogenic processes are involved such as diabetic retinopathy. A recent review has been published summarizing much of what is known about LMO2. 1. Boehm, T., R. Baer, I. Lavenir, A. Forster, J.J. Waters, E. Nacheva, and T.H. 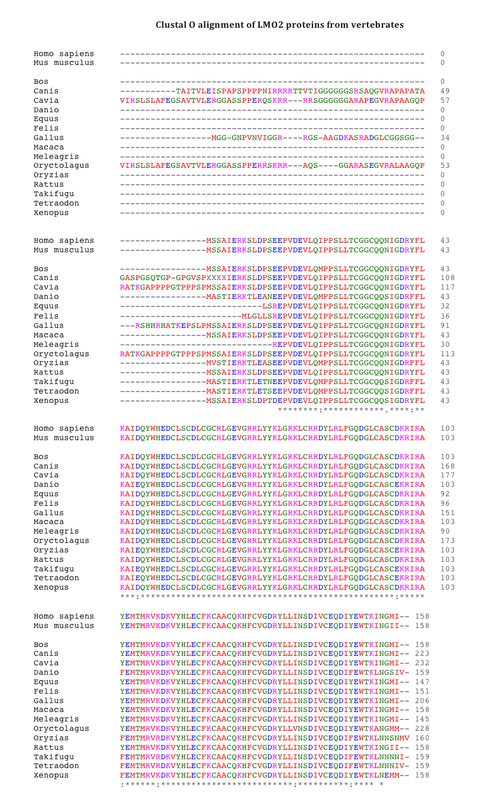 Rabbitts, The mechanism of chromosomal translocation t(11;14) involving the T-cell receptor Cd locus on human chromosome 14q11 and a transcribed region of chromosome 11p15. EMBO J., 1988;7:385-394. 2. McGuire, E.A., R.D. Hockett, K.M. Pollock, M.F. Bartholdi, S.J. O'Brien, and S.J. Korsmeyer, The t(11;14)(p15;q11) in a T-cell acute lymphoblastic leukemia cell line activates multiple transcripts, including Ttg-1, a gene encoding a potential zinc finger protein. Mol. Cel. Biol., 1989;9:2124-2132. 4. Rabbitts, T.H., K. Bucher, G. Chung, G.G. Grütz, A.J. Warren, and Y. Yamada, The effect of chromosomal translocations in acute leukaemias: the LMO2 paradigm in transcription and development. Cancer Res., 1999;59:1794s-1798s. 5. Wadman, I.A., H. Osada, G.G. Grutz, A.D. Agulnick, H. Westphal, A. Forster, and T.H. 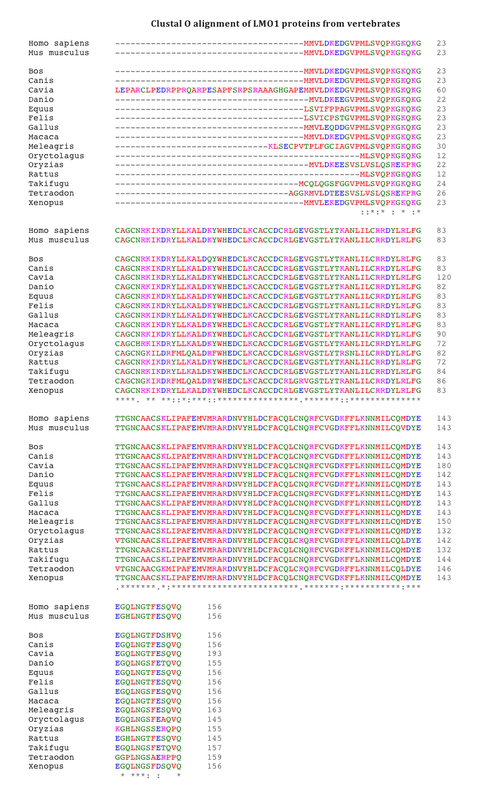 Rabbitts, The LIM-only protein Lmo2 is a bridging molecule assembling an erythroid, DNA-binding complex which includes the TAL1, E47, GATA-1 and Ldb1/NLI proteins. EMBO J., 1997;16:3145-3157. 6. Warren, A.J., W.H. Colledge, M.B.L. Carlton, M.J. Evans, A.J.H. Smith, and T.H. Rabbitts, The oncogenic cysteine-rich LIM domain protein rbtn2 is essential for erythroid development. Cell, 1994;78:45-58.